This warning, as emotional and overstated as it sounds, isn’t coming from some anti-science zealot or conspiracy theorist. It is, instead, coming from Nassim Taleb, distinguished professor of risk engineering at New York University, author of best-sellers The Black Swan and Fooled by Randomness, and shrewd investor who made a fortune when “black swans” like September 11 and the Great Recession occurred. Recently, he’s been making his feelings on GMOs crystal clear: they’re dangerous to the overall health of our planet. In a paper that’s available to the public, yet still in draft form, Taleb — along with two colleagues — lay out their case. GMOs are historically different from their naturally occurring peers in that their genetic make-up has been altered in a laboratory before being planted in fields. Often, these types of seeds are favored because of their ability to yield larger harvests and avoid certain pests or weeds that usually eat up some of their productivity. Taleb’s primary concern isn’t that ingesting GMOs is necessarily bad for us; he’s instead focused on the monumental threat such technology has on our worldwide ecosystem. While Taleb agrees that the relative risk of any one transgenic seed ruining the ecosystem is incredibly small, people are still underestimating the risks involved. That’s because, as humans, we are ill equipped to understand the mathematics behind such risks. 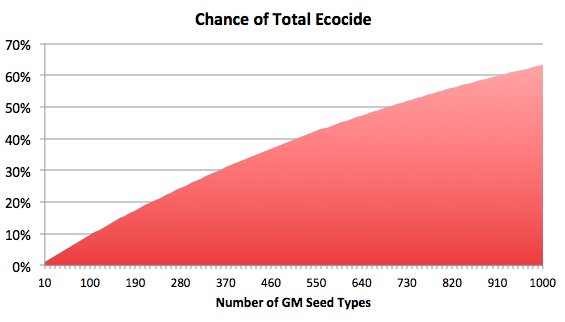 Let’s say each GM seed that’s produced holds a 0.1% chance of — somehow, in the intricately interdependent web of nature — leading to a catastrophic breakdown of the ecosystem that we rely on for life. All by itself, it doesn’t seem too harmful, but with each new seed that’s developed, the risk gets greater and greater. The chart below demonstrates how, over time, even a 0.1% chance of ecocide can be dangerous. I cannot stress enough that the probabilities I am using are for illustrative purposes only. 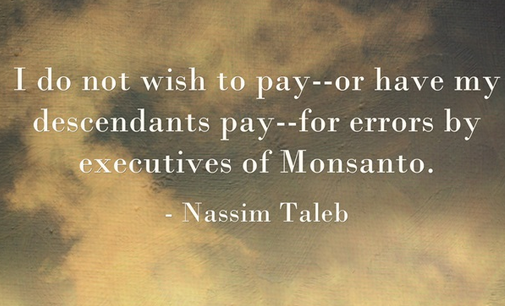 Neither I, nor Taleb, claim to know what the chances are of any one type of seed causing such destruction. The focus, instead, should be on the fact that the “total ecocide barrier” is bound to be hit, over a long enough time, with even incredibly small odds. Taleb includes a similar graph in his work, but no breakdown of the actual variables at play. Why be so worried if the level of threat isn’t known? The crux of this argument hinges on the fact that GMOs represent a systemic, and not localized, risk. Because the wind will blow where it wants to, insects will go — and carry with them — what they please, and GM goods will surely be exported to countries throughout the world, the concept of being able to control GM traits in nature is impossible to guarantee. Obviously, Monsanto (NYSE: MON ) , Syngenta (NYSE: SYT ) , Dow Chemical (NYSE: DOW ) , and DuPont (NYSE: DD ) have a vested interest in the success of GMOs — as these four produce the vast majority of GMOs in use right now. And if authorities start to heed Taleb’s warnings, it would cause investors in these four companies to take a serious hit. But the amount of revenue that each company derives from GMO activity varies quite a bit. Here’s how each company’s revenue total breaks down in their most recent annual reports. Source: SEC filings. Dow Chemical herbicides and pesticides account for 10% of total sales, and cannot be determined to be a by-product of GMO seeds or not. Monsanto derives about 30% of its revenue from “agricultural productivity,” which is the word they use for herbicides. It’s hard to tell how much of that is sold because of the Roundup Ready GMO seeds that are sold. Either way, it’s clear that GMOs are a huge part of Monsanto’s business. DuPont and Dow Chemcial, which have far more diverse business segments, are less exposed to sensitivities or possible regulations regarding GMOs. Unsurprisingly, Taleb has run into a fair share of criticism for his views. Humans have been modifying plants for years via selective breeding and tinkering with crops. How about the risk of famine without GMOs? This is “a deceitful strategy, no different from urging people to play Russian roulette in order to get out of poverty.” That’s because, as his probability shows, we’ll all end up dying in the end when we hit the ecocide barrier. The whole point is that these threats could lay dormant for years before they finally surface. When they do, they would be difficult to control, and could act fast. Risk is inherent in everything. We can’t just be paralyzed by fear and not progress. The risk of “generalized human extinction” is not inherent in everything. That’s because most consequences are localized, not systemic. And progress can be made using bottom-up techniques that have worked for eons. The precautionary principle — which is what Taleb calls his warning — is all about managing risk, not about waiting for it to surface. The fact that GMOs are a systemic entity is undeniable. Taleb is equally skeptical of all entities that carry systemic risk — like too-big-to-fail banks. Many of these new organisms — people often refer to potatoes or tomatoes being introduced into the Old World from the New World — were naturally occurring in nature, or the result of bottom-up tinkering. Also, the fact that there’s no evidence showing that GMOs have so far caused system damage doesn’t mean it won’t eventually surface. We don’t, as Taleb says, argue that a game of Russian roulette is safer with each empty barrel we find. It is, in fact, more dangerous. By no means am I as smart as Taleb when it comes to risk, and I don’t have a degree in agricultural sciences. I do find Taleb’s assertions to be a little alarmist. At the same time, as someone who spends a quarter of every year working on a coffee farm in Costa Rica that transitioned from conventional farming methods to permaculture ones — and having seen the vast improvements in the overall ecosystem on the farm, I think it’s wise to, at the very least, give some credence to the concerns Taleb raises. After all, it’s not that scientists are dumber than Mother Nature; it’s simply that Mother Nature has been around for about 300,000 times longer than us humans, and what she’s picked to stay around have obviously passed the test of time.